I wish my predictions for cold weather were wrong, but the north wind has been blowing and growth is slow so far in May. The first ten days of May also saw a meagre 21 hours of sunshine, bad for us and our plants! Be prepared, I fear, for more of the same, except for rather less rain and a little more sunshine. 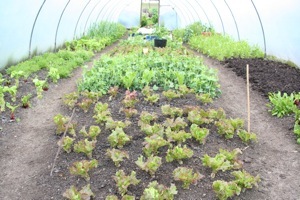 Tunnel still with some winter salads sown last September. 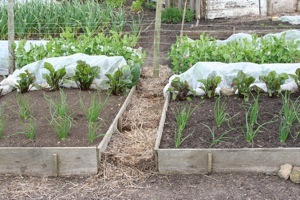 Outdoor Navara lettuce on right sown February, picked twice. We have enjoyed so many warm and dry springs recently that it has been an interesting reminder of different patterns of growth for the time of year. 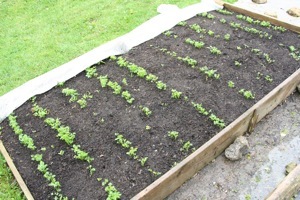 The photo of my bottom tunnel on May 13th shows many winter salads still cropping, such as Green in the Snow mustard. lettuce Rouge Grenobloise, scarole endive, flowering land cress, parsley between garlic and rocket of both kinds. It is good to be picking leaves off them because outdoor salads have, not surprisingly, been slower than usual, even under fleece which is still on. 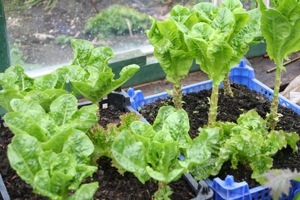 Many red lettuce have succumbed to mildew, especially Nymans which has yielded about two leaves weekly instead of five or six, although quality will return if it dries up. 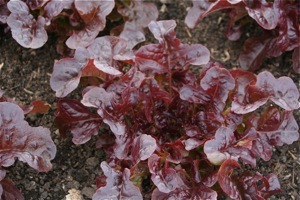 The best red lettuce has been Navara, pictured, also with little slug damage. Green cos types and oakleaf varieties have suffered a lot of slug nibbles at the base of their stems but so far I have lost almost no plants, just yield. 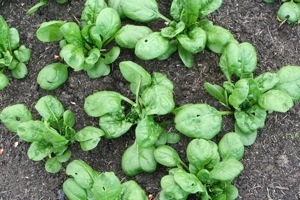 Spinach Toscane was sown March, planted April, no fleece. 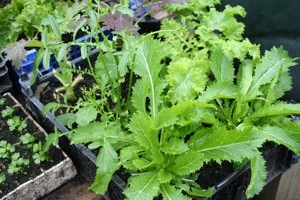 Orache and lettuce were fleeced (Feb sowing). 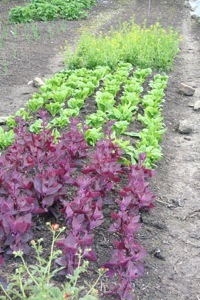 Other salads are holding their ground, growing slowly, such as spinach Toscane, orache and pea shoots. 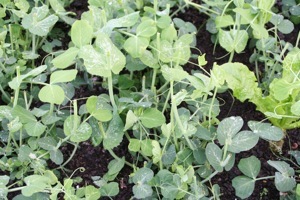 Pea for shoots, each plant now multi stemmed. Slugs have made their presence felt almost everywhere, far more in spring than since 2002, and it is worth removing lower leaves of nibbled plants which are the ones attracting slugs, because they are decaying, as in the photos. Taking off the leaves and composting them also removes a lot of slugs in the process – I found three molluscs from that one cabbage. I have been removing lower leaves and slugs from spring cabbage since February, every month or so, and mostly they have grown clean of holes in main leaves until the excessively wet weather of early May; there are now some slugs even venturing into healthy heart leaves. This is a serious sign of trouble ahead, for new salad and brassica plantings especially, unless some dry winds arrive soon. 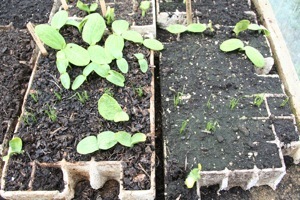 Garlic and broad bean were planted October, survived rabbit. 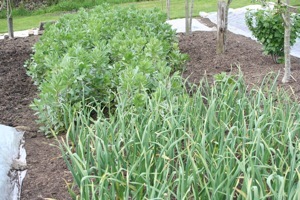 On the other hand, established plants like overwintered broad beans and garlic are growing well, with garlic even enjoying the extra moisture compared to previous springs. Perennial seakale has cropped well and has a rich, many textured flavour without any forcing, which to my mind was a dubious luxury invented by wealthy Victorian aristocrats, who could afford their plants to be weakened by the forcing. Rhubarb has also enjoyed the rain and I do not force that either. But asparagus is terribly slow here in my cold clay, only just starting to crop, compared to a relative abundance a few miles away at 200m lower altitude, on a friend’s field of Yeovil sand, which is free draining and warmer in wet weather. 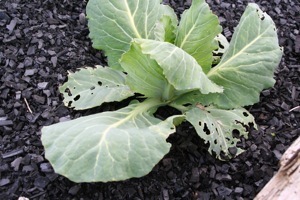 They grow commercially and have discovered the need to spray herbicide unless they want to lose all profit on weeding. Dug bed on left, undug on right & cabbage fleeced against pigeons. Charcoal bed is looking good so far, just needs warmth. Many plants ready to go out, tree spinach front middle. 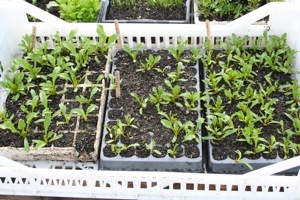 On right is all golden beetroot from different seed houses, Kings in right tray has grown best, Tuckers on left is average, in middle tray is Organic Gardening Catalogue and Thompson & Morgan seeds…. There was once a May here (1989) of endless sun and no frost, but this is sadly rare and it is wise to be prepared for many days when the coat stays on! The north winds look like continuing and we need to be careful. 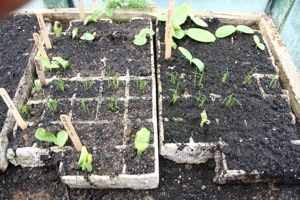 Sowings this month of French and runner beans, for example, are best done only in warmer, undercover spaces, into small pots or cell trays. 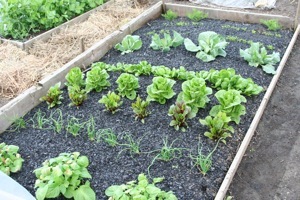 If you sow them outside, it needs to be a warm May, otherwise growth is weak and slugs become interested. Frosts are possible in much of Britain until mid month, as on 12th May in 2010 when the temperature here fell to -2C, cold enough to penetrate my polytunnel. Some tomato leaves were singed, but the plants survived, as did potatoes outside whose leaves were blackened by freezing. The effect of frost damage to potato plants is a later and slightly smaller harvest. Last year there were no frosts in May and new potatoes were ready by month’s end, but they won’t be this year, especially after the weather so far. After ten days of summer in March, April turned into a classic spring month of cool air, cold showers and occasional warmth in all too rare sunshine. A kick in the tail has been excessive rainfall in April’s second half which, at least, has washed the talk of drought away from our gardens and down to aquifers, where it has much more relevance. Continual rain at this time of year is a problem for seedlings which have to deal with growing numbers of slugs and a lack of warm sun. You can use fleece to cover beds with germinating seedlings and I find this effective in dry weather but have lost one bed of carrots whose emergence coincided with a wet period. 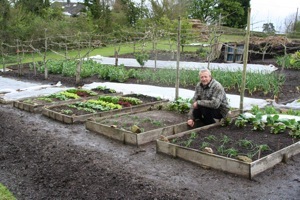 Unsupported fleece kept the surface moist and warm, perfect for slugs. 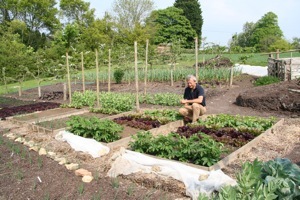 On the other hand, a bed that was sown and covered in mid March (also with fleece directly on the surface) has come up well, because it germinated in dry conditions and was established enough by the time it rained to resist the slug renaissance. May is changeover time in polytunnels and greenhouses where winter salad plants want removing as they flower (just twist them out and tread down the soil), to be replaced with tomato plants initially, then cucumber, basil, chilli, pepper, aubergine and melon. 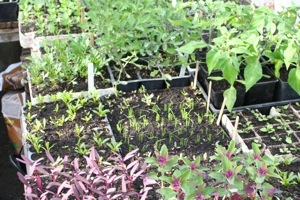 All my summer plants in pots and modules, in the greenhouse, have grown more slowly than usual and that balances the longer growth and later flowering of winter salad: I aim to remove salad plants and cover soil with about two inches of well decomposed animal manure before planting indoor summer vegetables. Last year my tunnels were entirely planted by late May, but this year I shall still be planting basil, cucumber, melon and so forth in June as only tomatoes have grown well in the greenhouse during April. 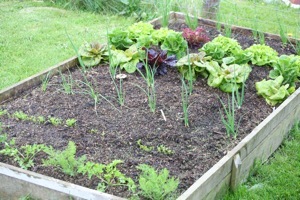 I have also experienced more difficulties with potting compost, except for cow manure, see the photos. All four module trays were sown with the same seeds on the same day, 13th April, and all cucurbits are struggling except for those in the eighteen month old, sieved manure – which is not perfectly decomposed and still has a fair amount of brown straw visible. 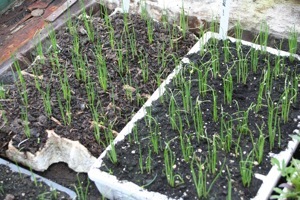 Leeks on the other hand have grown well in all four different mixes. Germination of winter squash has been poor so far, even on the warm propagating bench, and I wonder how old the seed is. Saving one’s own seed is the answer but cross pollination between varieties and even with courgettes means you need to do some work at flowering time, see www.realseeds.co.uk for excellent advice on seed saving. John Innes No 1, Violet Farm multip. 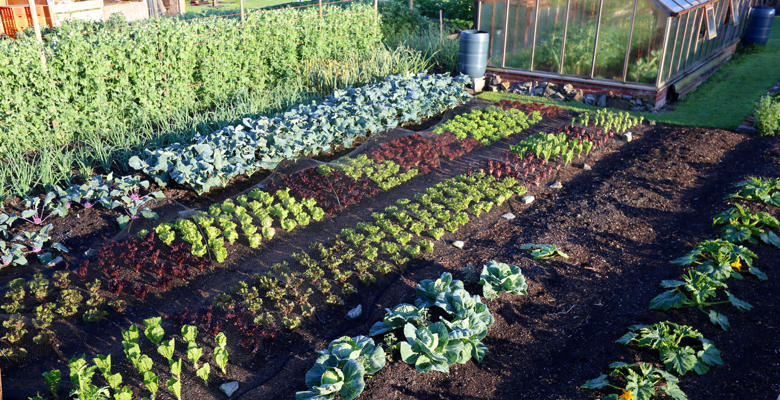 Although many spring vegetables should be well established by now, the first harvests of March sown beetroot, carrots, hearting lettuce, peas and broad beans will not occur until June. 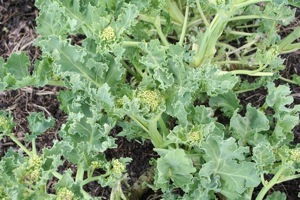 During May we are in the hungry gap, after winter vegetables have finished and before spring ones are ready. If you are feeling a dearth of harvests at the moment, remember to sow spinach, spring cabbage and spring onion in late August and broad beans in November. Also if you have enough space, to plant some asparagus next March, in soil that has been cleaned of all perennial weeds this year, most easily achieved with a light excluding mulch such as black plastic. If there is significant growth of couch grass and other perennials, I would leave the mulch on until November. Many annual weeds are busily germinating now and if you can hoe them as seedlings, do it as soon as possible before their roots become tenacious, on any dry day when you have a spare few moments. Hoeing when the soil surface is drying out means that all roots of disturbed weeds cannot re-grow, but if it is damp the hoe just moves weeds around and hand weeding is subsequently necessary. 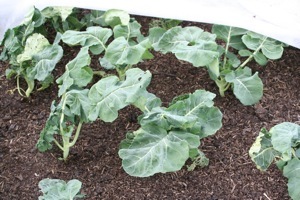 It is at least much easier to pull weeds out of surface compost and manure than out of surface soil, which is often sticky when wet or rather hard when dry. Don’t be discouraged when you see weeds germinating, just get stuck in and deal with them as soon as possible, while they are still small. That means you avoid having to do a bigger job later, and keep your beds nice and clean at all times.